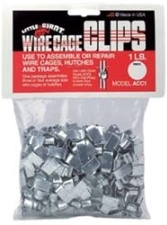 Use to assemble 14 to 16 gauge wire panels for rabbit hutches and pet homes. Great for other uses! One package assembles 3-4 average size units. Used to assemble 14 to 16 gauge wire cages. One package assemblies three to four average size units.